When you have irreplaceable data stored on your flash drive, it is all too easy to lose access to it. If you’ve lost critical data on your thumb drive, Gillware provides cutting-edge USB flash drive recovery services. USB flash drives are one of the many modern conveniences we all take for granted today. They are small and portable (about the size of a human thumb, hence the nickname “thumb drive”) and can be easily pocketed and brought from one computer to another. And because flash drives are solid-state devices, they can survive being dropped from far greater heights than a hard disk drive. With no moving parts, solid-state data storage devices have fewer points of failure than other storage devices. But thumb drives are still very vulnerable due to their small size and portable nature. The circuit board can be shorted out. The USB plug can become bent or torn off if the drive is bumped or jostled roughly enough while plugged in. Ejecting a flash drive too suddenly can cause damage to the filesystem. Do you have important data on your broken USB flash drive? Gillware is here to help. What’s In a Thumb Drive? There are three major components to any USB flash device: the NAND chip, controller chip, and USB plug. Most important is the NAND flash memory chip. This is where all the data on your thumb drive is stored. While the technology is radically different, it plays the same role as the platters in a hard disk drive. The NAND chip is attached to a printed circuit board along with a controller chip. The controller pieces the data flowing to and from the NAND chip together. Finally, there is the USB plug itself, which connects to the PCB and fits into the USB port on your computer. All USB flash devices have these components. But if you crack open your thumb drive’s casing, you might not be able to see all of them. You may open up your thumb drive and see, instead of a large black NAND chip and small controller chip on a green circuit board and a silver USB plug, a simple black rectangle with four gold “fingers”. All of the major components are still there—they’ve just been soldered together into a monolithic USB thumb drive, or “monolith”. There are a few advantages to this monolithic construction. It’s smaller, more water-resistant, more durable, and cheaper to manufacture. And it bears a striking resemblance to the iconic monolith from Stanley Kubrick’s 2001: A Space Odyssey. (Although that’s more of an aesthetic advantage than a practical one.) The main disadvantage is that it takes more effort for our engineers to access the data on the drive. There are two common “tiers” of flash drive recovery cases we see here at Gillware. 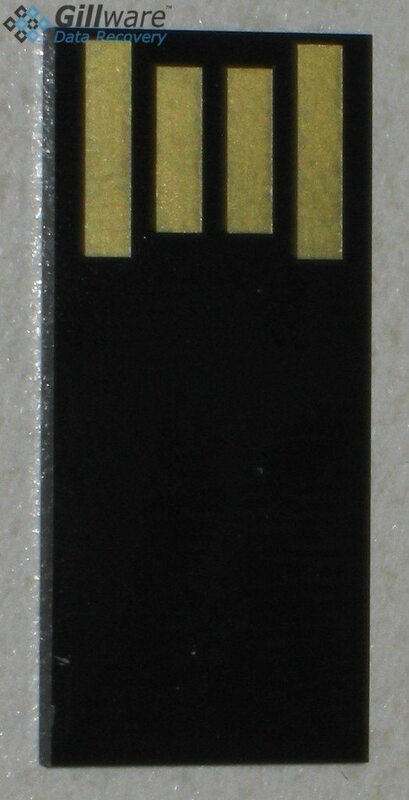 The first tier involves cases in which the connection between the USB plug and PCB has been damaged. The second involves cases in which the PCB has been damaged and the NAND chip must be removed from it. For USB devices where all the components are discrete, there is one major weak point. The connection between the USB plug and circuit board is very fragile. If you have your thumb drive plugged into a USB port and accidentally hit or bump the device, you could bend or shear off the leads connecting the plug to the circuit board. This is one of the more common reasons people bring their thumb drives to us. It takes a highly skilled engineer some time with our soldering equipment to repair the flash drive. After the drive has been repaired, recovering data from it is usually a simple matter. There may be some file corruption if the USB flash drive was damaged in the middle of a write operation. 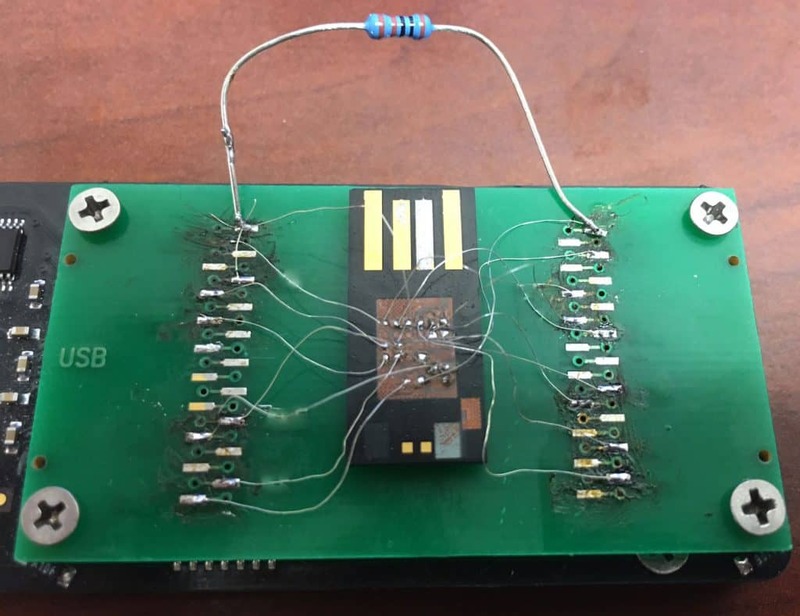 In cases where the circuit board itself has been damaged or shorted, flash drive data recovery involves removing the NAND chip from the board and reading its contents using a chip reader. The data on the NAND chip is nothing like what a data recovery engineer can find on a hard drive’s platters. The NAND chip’s contents are a jumbled mess of both user data and the system data the flash drive needs to operate. It is the job of the controller chip to make sense of all this. For us, reading the chip is the easy part. 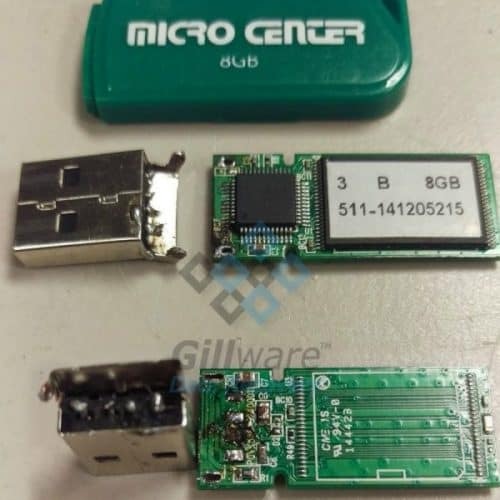 Our USB flash drive data recovery experts have to write custom software to emulate the controller and reassemble the raw data from the NAND chip. For monolithic recovery cases, this task is a little more difficult. The monolith can’t be disassembled, but we do still have a way to gain access to the NAND flash memory chip inside. By “spiderwebbing” tiny wires to specific contact points on the device, our USB flash drive experts can access the buried NAND chip. Our R&D director Greg Andrzejewski explains this complex and delicate process in greater detail in this video case study. This is the more complex of the two common tiers USB flash drive data recovery cases fall into. Between the various brands and models of flash drives, each controller chip does its job a little differently. Concerning monoliths, there is no industry standard for the contact points allowing access to the data. Salvaging data directly from a NAND chip requires clever detective work and reverse-engineering. Why Choose Gillware for My USB Flash Drive Data Recovery Needs? Gillware Data Recovery employs full-time data recovery technicians and computer scientists dedicated to staying on the cutting-edge of data storage and recovery technologies. At Gillware, we offer financially risk-free flash drive recovery services. We charge no evaluation fees, and even offer to cover the cost of inbound shipping. We don’t show you a bill until we’ve finished our recovery efforts. If we don’t recover any data you need, you owe us nothing.